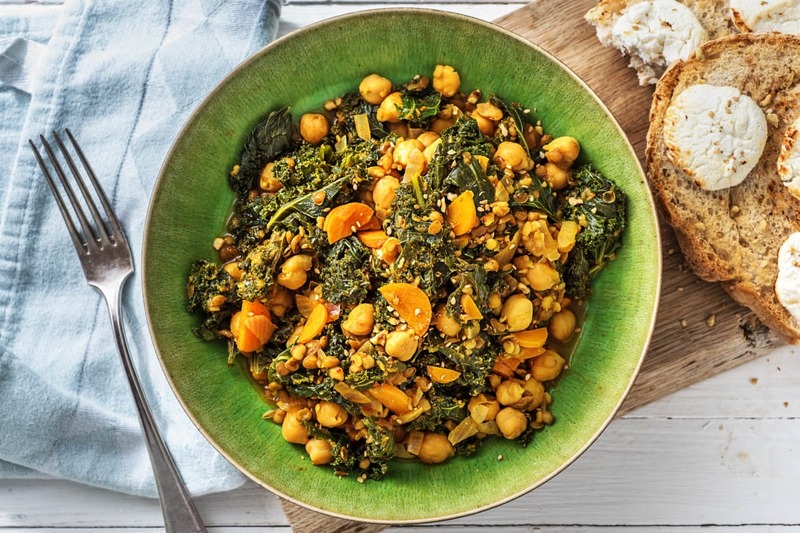 Here’s a 20-minute bowl full of goodness that will nourish you from the inside out. 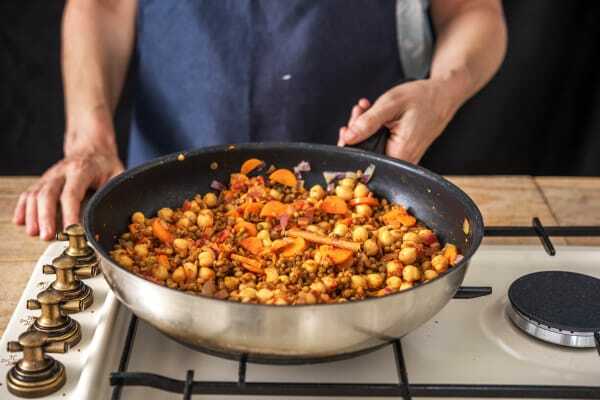 Packed with veg, protein-packed pulses, and delicately seasoned with cinnamon, ginger, turmeric, cumin and chilli- the flavours in this dish are second to none. Serve with grilled goat’s cheese ciabatta and top with nutty dukkah for the final touch. Cosy nights in never looked so delicious. a) Halve, peel and chop the onion into small pieces. b) Trim the carrot (no need to peel). Halve lengthways then slice into thin half moons. 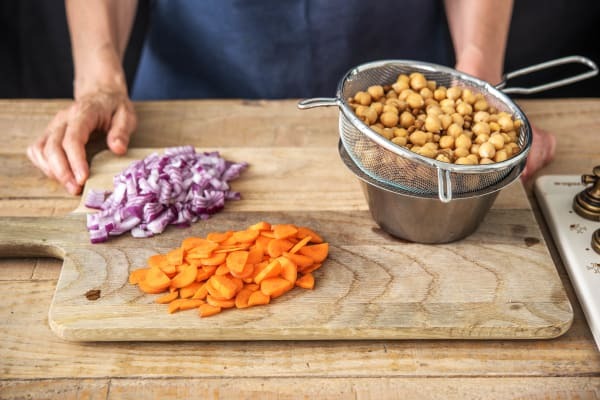 c) Drain and rinse the lentils and chickpeas together in a colander. Set aside. 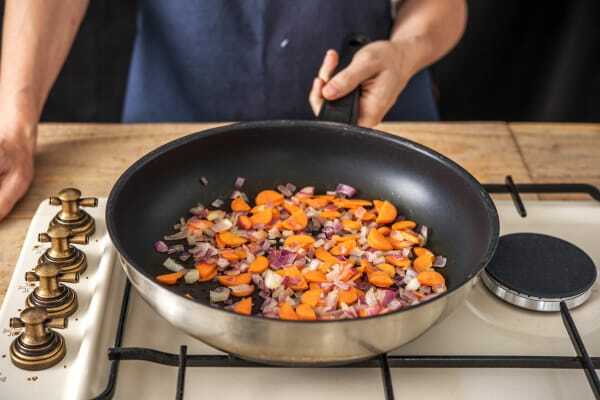 a) Heat a splash of oil in a large frying pan or saucepan over medium-high heat. b) Add the onion and carrot. Fry until softened and starting to colour, 3-4 mins. a) Pop the easy ginger, cinnamon stick, turmeric, cumin, chilli flakes (add more if you like some heat!) and tomato purée into the pan. Stir well. b) Cook for 1 min. c) Stir in the lentils and the chickpeas. a) Add the water (see ingredients for amount) to the pan. Bring to the boil. b) Add the stock powder and stir to dissolve. 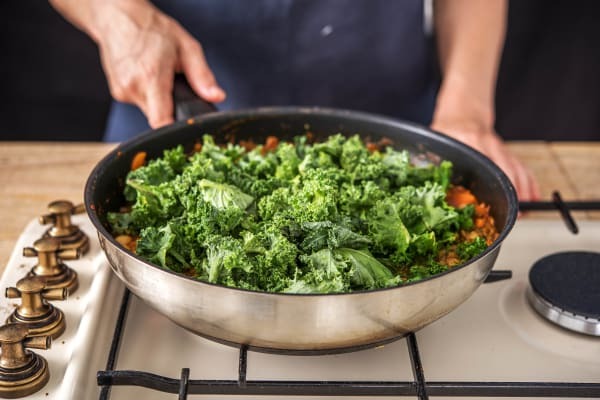 c) Pop in the kale and cover the pan with a lid or foil. d) Cook until the kale is soft , another 4-5 mins. a) Slice the ciabatta in half lengthways - as if you were making a sandwich! b) Cut the goat's cheese log to give you 4 slices per person. 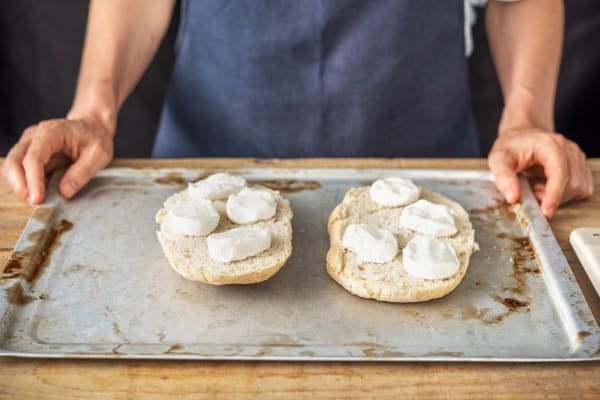 Lay the goat's cheese slices over the cut side of the ciabatta. c) Pop on a lined baking tray and grill on the top shelf of the oven, until the cheese has softened and is starting to colour, 3-5 mins. a) When the kale is ready, remove the cinnamon stick from the lentils. b) Season to taste with salt and pepper. 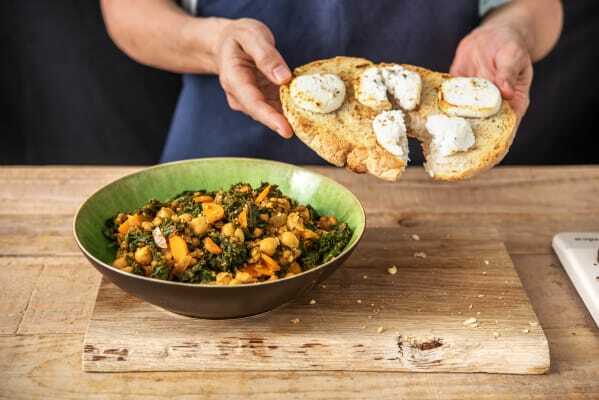 c) Serve the lentils in bowls with the goats cheese toast on the side. d) Sprinkle the dukkah spice mix over the toast and lentils. ENJOY! You made this! It looks so tasty. You should be proud. Take a moment to admire your great work.